Have you ever read a really good book and envisioned what the characters might look like if they were to lift themselves off the pages and into real life? What if those characters were super heroes who brandished formidable symbols of sordid pasts all over their skin? And instead of names like Superman, Spiderman, and Captain America they called themselves Big Ant, Johnny O and Joe Panz? 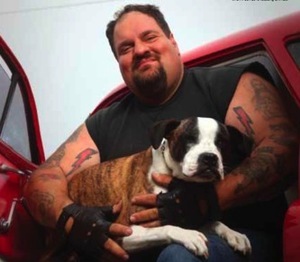 Their mission is not to save America but to give animals in a need a responsible home, swooping in on their motorcycles and busting abusers’ mindsets one at a time. These are the super heroes called Rescue Ink and this is one day in the life of these non-caped, tattoo-laden crusaders. A reporter approaches the elementary school wondering what fine mess she’s gotten herself into. “Riding with a pack of motorcycle men on assignment?” she ponders to herself. After receiving security clearance, she tiptoes past lockers and giggles, the aroma of fresh chalk and foil-covered lunches in the air, toward a classroom. Behind the brightly colored door sit a pack of men on kiddie chairs, at a kiddie table, walls adorned with ABCs. An eruption of laughter bursts from the guys as Big Ant chortles one of his many words of wisdom that would lighten the load of the day. Today Rescue Ink starts young. “We’re talking to these kids to educate them about animal abuse and what to watch out for. But we go out to reform schools and teach about second chances. We aren’t exactly angels ourselves,” Johnny O declares. Passing the microphone along, the guys introduce themselves and get right to business. “What types of animals shouldn’t people own?” Joe asks the tiny tots. “Alligators,” one child reports. “Dragons,” says another. “Pomeranians!” Laughter engulfed the room. What isn’t funny are the dangers that Rescue Ink faces each time they investigate an abuse or neglect case. Perhaps best recognized for their television show on the National Geographic channel, the guys from Rescue Ink have been together fighting animal abuse for many years. Case in point: Pack leader Mary calls the guys to report a possible abandoned dog in a vacant home in a small suburb of New York. We’re off faster than a speeding bullet in a single bound. Stopping en route to the scene for a red light, people honk, cheer and a police officer shakes the hands of the men in black riding their Harleys. Superheroes indeed. 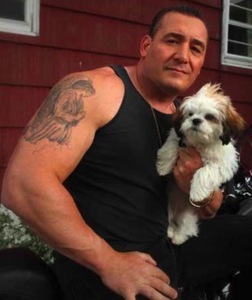 Arriving at the scene, Joe Panz and his posse of puppy patrol approach the house solider style, an army for the animals. They line up, these muscled inked men, and knock, peer into windows, canvas the property. No barks are heard. Is the dog alive? Is someone in there? There isn’t much time to answer these questions before the police arrive. “When people tell us they’re calling the cops, we say go ahead,” Johnny O remarks and walks with Joe to exchange handshakes with law enforcement. After much ado, nothing turns up. An abandoned doghouse is found in the rear of the property but no sign of a dog. “We’ll follow up on this one. Joe is calling the guy who reported this right now,” Johnny O informs. With a neighborhood of onlookers forming, we pack into our respective vehicles and travel to meet the most tattooed of the group: Scott, who is one of the roughest looking pussycats of the pack. Scott, like the rest of the guys, has a special affection for Pit Bulls. And Poodles. Scott is proprietor of a very popular grooming shop in New York. We spend the rest of the afternoon hanging out in front of the grooming shop. The honking and cheers of support from passers-by garners waves and crooked smiles from this group of unlikely heroes.